LUFT -[No title] Daniel's Dream Map. LUFT,H. after - [No title] Daniel's Dream Map. Title : [No title] Daniel's Dream Map..
Map maker : LUFT,H. after. Date : Hans Walther, Magdeburg 1545, 1550. Size : 4.6 x 6.0 inches. / 11.8 x 15.2 cm. Description :A somewhat curious map of Europe, Africa, and Asia is to be found in apocalyptic literature originally emanating from Wittenberg in 1530 or even 1529. 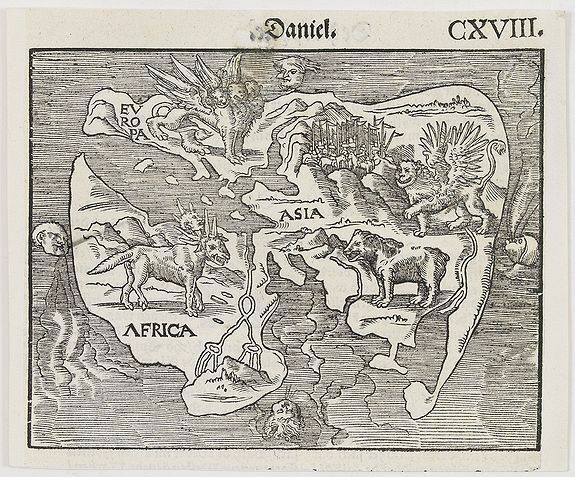 The map was used by the printer Hans Luft to illustrate two works: one a commentary on the prophet Daniel by Martin Luther (1530) and another linking the vision of Daniel with the assaults of the Turks on the perimeters of Christian Europe at the time. According to Ernst Gallner this is the second wood block in a first state, prepared by Melchior Schwarzenberg or Moritz Schreiber and published "Biblia, De Propheten alle dudesch". The map is a cut-out from a larger text sheet and has Dutch text on the verso. Condition : Wood block print. Left and right margins cut to outer margin and professionally re-margined. Little spot in upper part of the map.